The REAL Wallet – He Said What?! First, let me give some background. Aaron had a Swiss Army wallet that he liked a lot……..”had” being the key word here, I’m afraid. I didn’t buy the Swiss Army wallet because of the name brand. In fact, it was more expensive than I would have usually paid. I bought it because it had a zipper section for his loose change. However, that zipper finally broke – meaning that his change would fall out. That was a problem. When we were in West Virginia in September, my niece Sarah was there. Sarah sells Thirty-One products and just happened to have some items with her that she was selling for a reduced price. 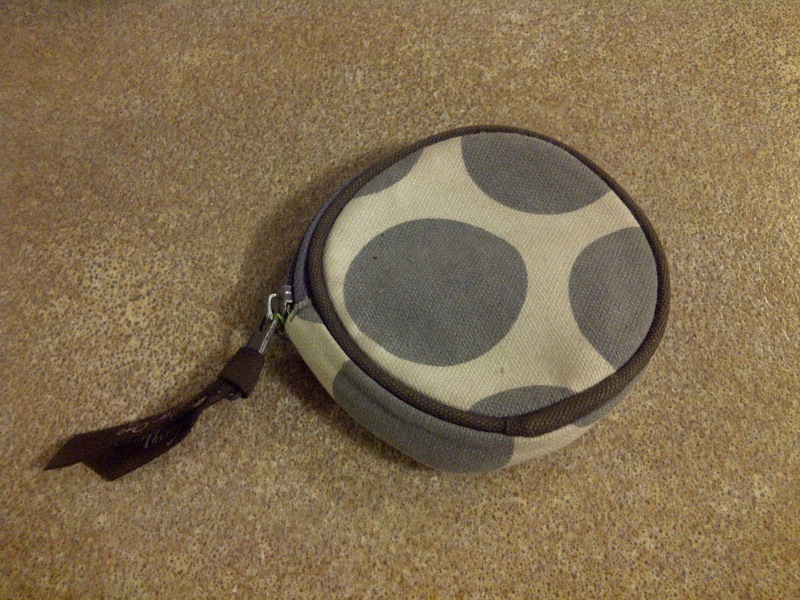 I spied this really nice, handy change wallet that looked more male than female, you know………….so I bought it for Aaron, to hold that loose change that kept falling out of his broken change holder in his very loved Swiss Army wallet. This arrangement has worked beautifully for lo these many months. I put his cash in his Swiss Army wallet and his loose change in his Thirty-One change wallet. And merrily he goes his way. But remember that Aaron has that interesting little Asperger’s trait………….let’s see…………….yes! Insistence on Sameness. And why do I mention that trait? Because on Friday Aaron came home with only his Thirty-One change wallet. Somewhere, we’re fairly certain, he lost his Swiss Army cash wallet after buying his large popcorn and water sample (as he calls it) at the theater. So today I gave him his $5.00, sticking it down in his Thirty-One change wallet. When he came home today and told me about his day, he didn’t say anything about spending money. He did say that he hadn’t found his Swiss Army wallet. After he walked away, I noticed that the $5.00 was still in his change wallet, untouched. Hmmmm………….that’s unusual. As we talked at supper, I asked him if he ate anything at the bowling alley and he said no. When I asked why he hadn’t used his money to buy something, he said, “Well, I didn’t have my wallet.” I reminded him that he did have his wallet, his round change wallet, and that his money was in there. As we talked, Gary and I realized that Aaron would not use his round change wallet because to him, it wasn’t the right wallet to be holding cash. Cash goes in the Swiss Army wallet, people!!!! Not in the Thirty-One change wallet!!! I questioned Aaron a little longer to be sure that I had this correct and understood it. He started getting a little frustrated at my questioning, so I told him that I was just trying to understand so I’d know what to do tomorrow. Oh Aaron, dear, you took the words right out of my mouth! HaHa!